Not much to say about this one cept NICE UH INVERT ROCK!!! Notice the tree house that the ramp was attached too. Im gonna post all the pics from this session this week I think. 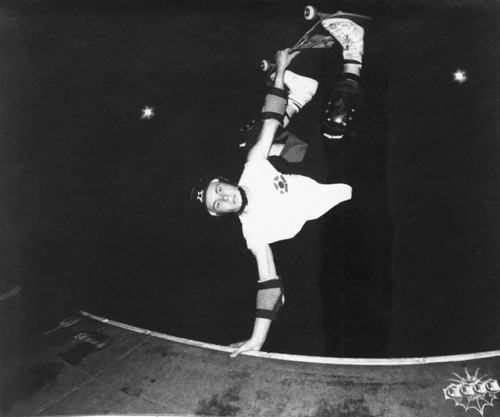 This entry was posted in 1987, DJ VertOne, four 4, Matt Klein's ramp, Photos by Wig, Rocky Vertone, SPOTS:, TEAM STEAM and tagged ART, backyard ramps, boards, east coast, jason, Jason oliva, jasonoliva, kleins ramp, New Jersey, New York City, oliva, paintings, photography, pool Skating, ramp, ride, Rocky Vertone, sk8, sk8t, skate, skate decks, skate history, skate photography, Skate ramps, skate trucks, skate wheels, skateboarding, skateboarding history, skateboarding photography, skateboards, skatepark, skater, SKATERS, steam, Street Skating, TEAM STEAM, The Barn, The House of Steam, thos, vert, vert ramps, Vert Skating on April 25, 2007 by jasonoliva. Couple reasons for posting this photo…First a photo with Jay wearing a helmet is as elusive as a photo of Big Foot. I’m not sure but this one could have been altered by photo shop to show him wearing a helmet. Second reason was to show how close those fricken beams were that went across the flat bottom were. People like Jay and Captain John Ballon looked like they were gonna smack em every time they skated. I do believe a BMX rider had a real Head Cracker incident. Anyway nice camera work Wig! Splitting the beams and capturing the elusive helmeted Senor Henry. 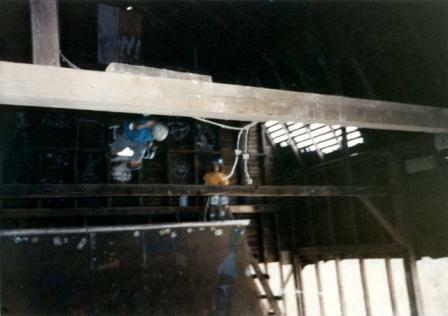 This entry was posted in 1988, Photos by Wig, TEAM STEAM, The Barn and tagged ART, backyard ramps, barn, boards, east coast, jason, Jason oliva, jasonoliva, Jay Henry, New Jersey, New York City, oliva, paintings, photography, pool Skating, ramp, ride, sk8, sk8t, skate, skate decks, skate history, skate photography, Skate ramps, skate trucks, skate wheels, skateboarding, skateboarding history, skateboarding photography, skateboards, skatepark, skater, SKATERS, steam, Street Skating, TEAM STEAM, The Barn, The House of Steam, thos, vert, vert ramps, Vert Skating on April 20, 2007 by jasonoliva. Man this ramp was fun to ride! Someone should have slapped a Barn over it…Yep thats WeepStar on deck I see Rock as well…Dennis Kane doing his thing. No complaints outta me looking back at my teenage years, dat’s da troof! 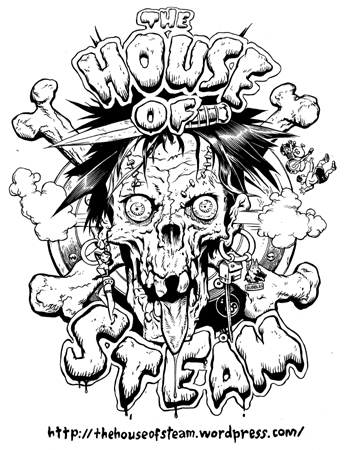 This entry was posted in 1988, Dennis Kane, DJ KING WEEP, DJ VertOne, four 4, Matt Klein's ramp, Photos by Wig, Rocky Vertone, SPOTS:, TEAM STEAM, Weeps, Who’s on deck? and tagged ART, backyard ramps, boards, Dennis Kane, east coast, jason, Jason oliva, jasonoliva, klein ramp, New Jersey, New York City, oliva, paintings, photography, pool Skating, ramp, ride, sk8, sk8t, skate, skate decks, skate history, skate photography, Skate ramps, skate trucks, skate wheels, skateboarding, skateboarding history, skateboarding photography, skateboards, skatepark, skater, SKATERS, steam, Street Skating, TEAM STEAM, The Barn, The House of Steam, thos, vert, vert ramps, Vert Skating on April 17, 2007 by jasonoliva. So beside being a classic photo the reason I posted this is because I hae had more then one request to post the Ken Sigafoos designed stickers for Cheap Skates especially the “I skated cheapskates long cold winter of 88” So if you got one scan it and send it in if its stuck on something send a picture….and Ken if your out there send some pics and art work…. This entry was posted in 1988, 2. SKATE SPOTS:, Cheap Skates, Dan Tag, Ken Sigafoos, Photos by Wig, SKATE PARKS:, SPOTS:, TEAM STEAM and tagged ART, backyard ramps, boards, cheapskates, Dan Tag, east coast, jason, Jason oliva, jasonoliva, Ken Sigafoos, New Jersey, New York City, oliva, pA, paintings, photography, pool Skating, ramp, ride, sk8, sk8t, skate, skate decks, skate history, skate photography, Skate ramps, skate trucks, skate wheels, skateboarding, skateboarding history, skateboarding photography, skateboards, skatepark, skater, SKATERS, steam, Street Skating, TEAM STEAM, The Barn, The House of Steam, thos, vert, vert ramps, Vert Skating on April 4, 2007 by jasonoliva. 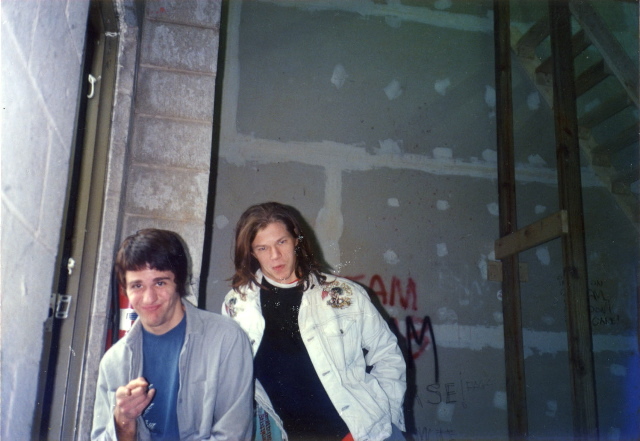 So we have a crazy good new stash of pics from our man WIG… skater, ramp owner, uber silk screen company owner and once upon a time moped rider. Cannot thank him enough…The Wig Collection as I am calling it is right up there with The Roenning Collection….. 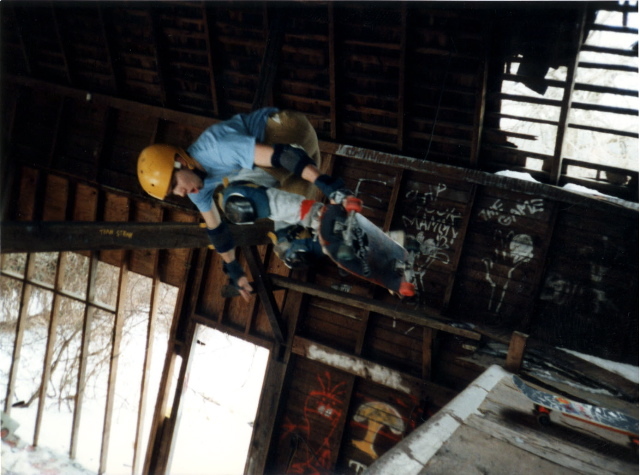 This entry was posted in 1987, Jimmy Kane, Photos by Wig, SPOTS:, TEAM STEAM, The Barn and tagged ART, backyard ramps, boards, east coast, jason, Jason oliva, jasonoliva, Jimmy Kane, New Jersey, New York City, oliva, paintings, photography, pool Skating, ramp, ride, sk8, sk8t, skate, skate decks, skate history, skate photography, Skate ramps, skate trucks, skate wheels, skateboarding, skateboarding history, skateboarding photography, skateboards, skatepark, skater, SKATERS, steam, Street Skating, TEAM STEAM, The Barn, The House of Steam, thos, vert, vert ramps, Vert Skating on March 28, 2007 by jasonoliva.